NEW YORK (Reuters) - Owning electric carmaker Tesla Inc's shares is close to the riskiest it has ever been, data by options database and analytics firm OptionMetrics showed on Wednesday. More than a month since Chief Executive Elon Musk tweeted a proposal to take the company private, only to abandon the idea in subsequent weeks, traders in the options market remain nervous. Tesla's one-month implied volatility skew, a measure of investor sentiment toward downside risk, is at about 14 percent, not far from a record high, according to the firm's data. "If you own a long position in Tesla and you wanted to hedge it with an out-of-the-money put, it's becoming more and more expensive," said Garrett DeSimone, head of quantitative research at OptionMetrics. Buying of put options conveys the right to sell shares at a fixed price in the future. Out-of-the-money puts are contracts that make money if the stock drops and are typically used by investors to protect against a fall in the share price. "It is an indication that the market is concerned about large downside risk," said DeSimone. One-month skew shot up as high as 18.5 percent in late August and has largely remained elevated since then. The only other time the measure was higher was in March, following a credit downgrade of the electric car maker by Moody's Investors Service. 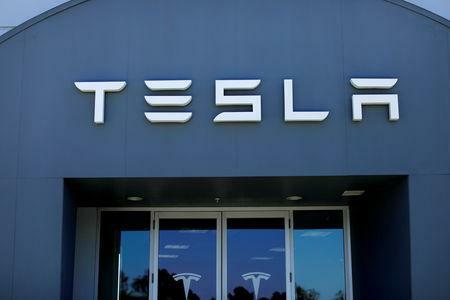 The recent departure of two high-level executives, media reports of a U.S. Securities and Exchange Commission probe into Musk's tweets and the CEO being filmed smoking marijuana and wielding a sword on a webcast have weighed on Tesla's share price. Tesla stock is down about 25 percent from the multi-month high of $387.46 reached on Aug 7. On Wednesday, the shares were up 3.2 percent. Investors' skepticism about the fate of the shares is evident in the accumulation of large number of put contracts at the $50 strike price, expiring in September and mid-January. The contracts make up the two largest blocks of open Tesla options and account for about 8 percent of all open Tesla contracts. Put contracts conveying the right to sell the shares at $50 by Sept. 21, have grown to nearly 100,000 contracts from 37,000 contracts on Aug. 6, according to Thomson Reuters data. The January $50 puts have also logged an 11 percent increase over the same period. "I think it is the non-believers expressing their outlook that Tesla's stock price may be much lower," said Matt Amberson, founder at Chicago-based volatility and options data firm ORATS. "The stock does not need to go down all the way to $50. If the stock went down quickly, the January 50 puts would rocket higher in value," he said. The contracts may also reflect players in the credit market looking to hedge their risk, analysts said. "If you own a lot of credit-related instruments in Tesla, a way of hedging the long-term value of that credit would be to buy put options," said DeSimone. Tesla bonds have slumped in recent weeks on worries about Tesla's ability to generate cash to pay back debt. Its junk bond < 88160RAE1=> traded at an all-time low of 82.625 cents on the dollar on Sept. 7.